YOU may use after pay at Trade Me for all your purchases. 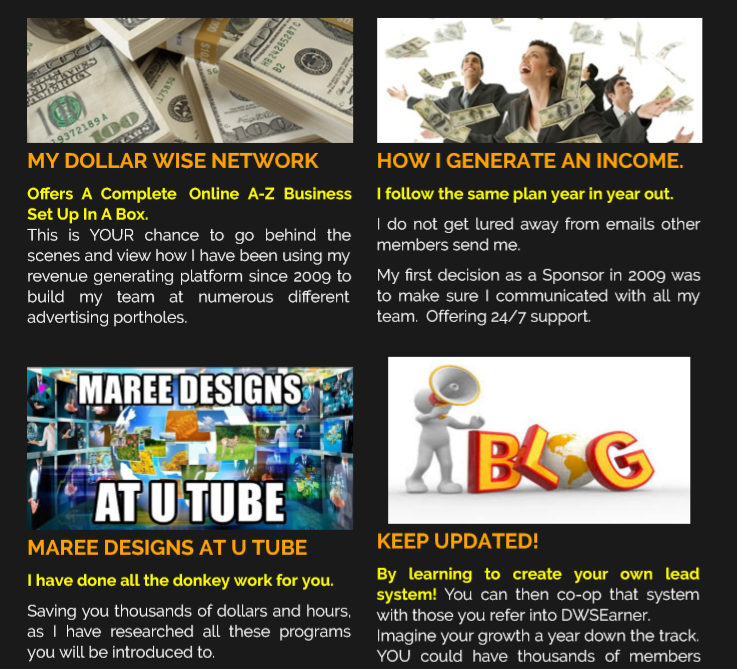 Maree Designs is the Founder & Developer of the Dollar Wise Network. Established 2009. I am an Online Entrepreneur and Mentor. Life Style Coach for everything affiliate marketing related. Introducing sellers to buyers and advertiser. Offering training and set up guides at my Fiverr Store. Access Our Proven and Tested Affiliate program to generate a Second Income Working Online From The Comfort Of Home. While promoting your Main Business Products. Learn all there is to know about business branding and expanding your client base with repeat sales. Putting our entire Data Base to Work For You. Check out my Fiverr Store for all your Affiliate marketing requirements. Admin Watch. Rewarding my clients for participation. Shop at any of my online stores receiving Admin Watch Points with cash back rewards for every dollar you spend.